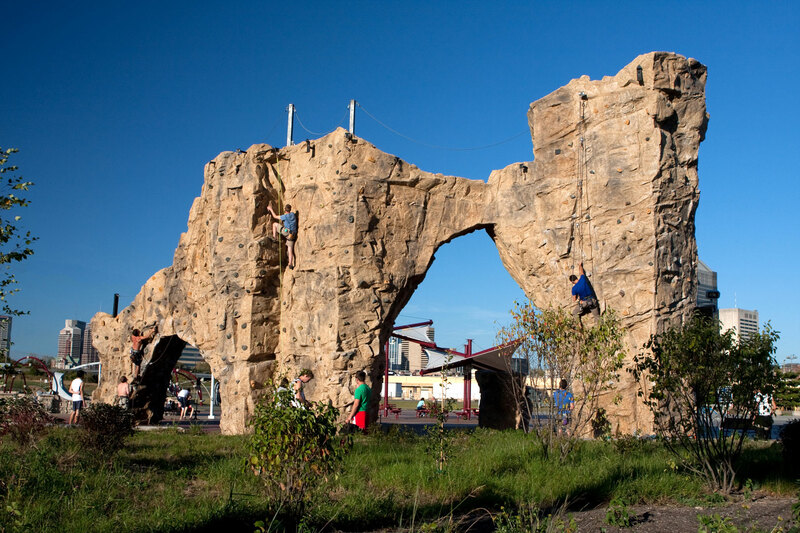 Outdoor Climbing in a Minneapolis City Park? Yes, Please. This photo is an outdoor climbing structure in a city park in Columbus, OH. It is free to use and sits in the park just like a typical school yard playground. Would you like to see something like this in Minneapolis? It has just come to our attention that there is an opportunity to make that happen. On Tuesday, 2/24, from 6-7:30, there is a public input meeting at Mill City Museum for the new city park that will be built in front of the Vikings stadium in downtown Minneapolis. The park will be fully funded through previous bills and whatnot, so there is no fundraising to be done. What we can do, though, is show up in force at this meeting and/or overload their online Activities and Amenities Survey with our desire to have something like this here in MN. Let’s turn out for this meeting and let the city know that climbers are active people that will take advantage of their park. Build it and we will come! The City of Minneapolis is embarking on a once-in-a-generation opportunity to design and build a new public open space in Downtown Minneapolis. The Downtown East Commons is a 4.2-acre site located next to new office and residential buildings, light rail, and the new multi-purpose stadium. The Commons will serve the downtown community, workers, visitors, residents of Minneapolis and the region. It will also host events connected to the new stadium. The City of Minneapolis has hired a world renowned team led by landscape architects Hargreaves Associates to design a welcoming green venue that will serve as a respite from the work day, a neighborhood park and an entertainment destination. We need your input to design a venue that truly reflects a community vision for this open space in the middle of our great city. Please attend the first public meeting, take the online survey, register to get more information, and keep an eye on this web site for project updates.